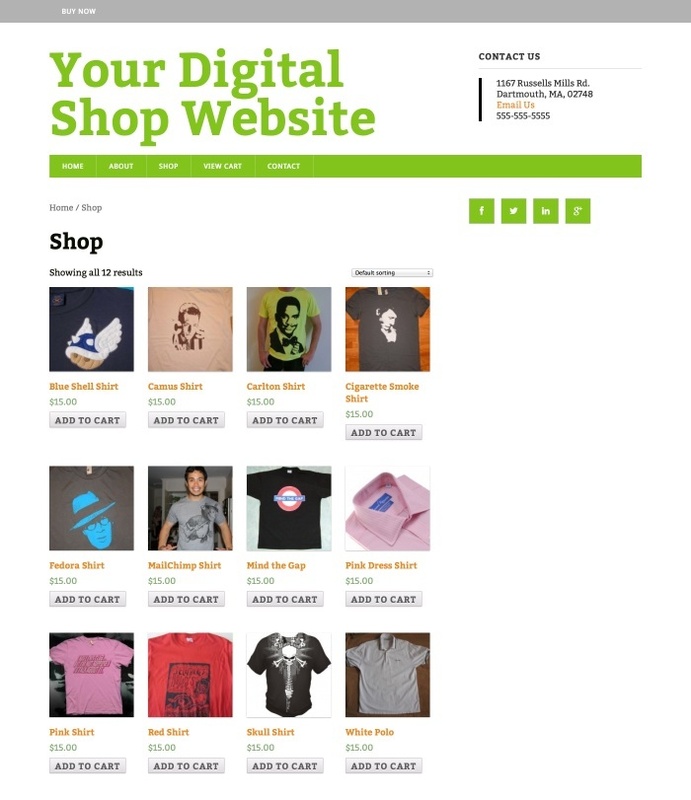 Having an eCommerce website that is not optimized for Google is like having a store without a sign, window, or door. The products are there, but there is no way for a prospect to find your content. The web is the place to sell your product. Whether it be physical or digital, the first place someone may go to look for a product is the web. This may be to find a local product offering or to purchase a product at a better price. All of your product may be on the website, but if nobody can see it on Google, then what’s the point of putting it there? We will also use the popular WooCommerce eCommerce plugin as a backbone for how to add and optimize the content on your WordPress eCommerce website. Better eCommerce SEO begins with the content that you have on your page. Google does not have a “personality filter” or a “daydream algorithm.” At the end of the day, people are still going to be searching for your content using text and keywords. It is important that you choose and implement the right keywords on your page. But how do you do that? Am I using long-tail keywords? Creating unique keywords is vital to appearing on search engines and optimizing content on an eCommerce site. If you sell winter coats, for example, simply including “winter coats” as your focus keyword will NOT be enough. Use tools like Google Adwords to find better and longer strings of keywords that people are looking for. When you create keywords that are longer, like “pink North Face winter coat,” this is an example of a long-tail keyword. Quite literally, this is a keyword that is longer and has more chance of appearing on the first page of a Google search. Including this long string of text in more places helps to ensure that if someone is looking for a “pink North Face winter coat” that you will be more likely to appear. You are not one of 1.3 million sites trying to rank for “North Face” or “Winter Coat“. You are an AUTHORITY on the “pink North Face winter coat” and people are more likely to find your site for that specific product. As for where to place these keywords, let’s start from the top of a WordPress post, page, or product and the most important place to put your keywords — the title tag. On SEO optimized WordPress themes, the title tag or H1 tag of the page will be associated with the title of each page or post. It is important to include your entire long tail keyword in the title. If you are selling “Chunky Basil Tomato Sauce” on your eCommerce website, you will want to make sure that you include at least that text on your product’s title. Additionally, you will want to install WordPress SEO by Yoast to maximize the SEO title for Google’s search engines as well. With this tool, you can optimize the Site Title to make it display differently on Google’s search engine. Perhaps you add some “Buy Now” text to your Google site title so people know they can purchase your product from that link. 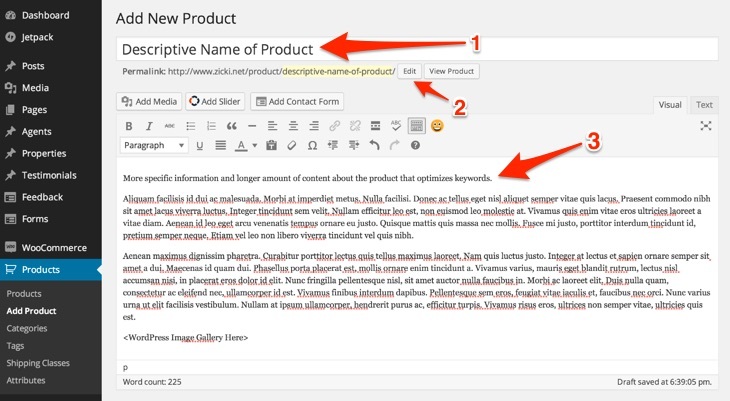 Underneath the title of the product is an area to write some information about your product. In this area, you can enter more detailed information about your product. This information should feature your focus keyword in multiple places and in the first sentence of the description. There should also be a lot of text and maybe some testimonials or custom written reviews on the product in this area to flesh out the content and add value to the product. The more time you put in to the content, the more attention the content is going to get on Google. 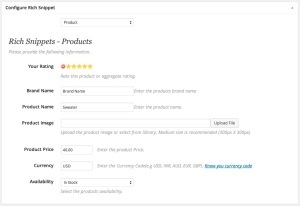 The product description, in WooCommerce terms, is the content that appears on the top of the page. This is where you would display quick information about your product, including your keywords! One awesome tip we picked up from the Nielsen Norman Group involves keeping your content concise and comparable. Keep the content here limited to the keywords you want to use, perhaps a sentence or two more, and then bulleted information on the product. Another great WordPress eCommerce SEO tip? Create a blog for your website and update it regularly. The more content you have outside of your product offerings, the more chances you have to grab customer attention from a Google search and get them on your website, where you can then sell them on your products. Use services like Trello to create lists of blog ideas on your website so that you always have something fresh to write about. If you’re going to get serious about blogging, make sure that your WordPress theme has plenty of different Widget Areas to place relevant call to actions to get people to move from your blog post to a product or a shop page with many of your products. Think about the last time you were at a grocery store waiting impatiently for the one cashier to ring your items. You stamped your feet, found the next aisle or self-checkout aisle and went over there instead. The web is THE SAME WAY. The more time — and we are talking fractions of a second — that a user has to wait to load your page on their computer or cell phone, the less likely they are to stay and buy your product. Make sure your WordPress theme and plugins are lightweight so that they do not take long to load. Also make sure that the host you choose is going to allow for your website to load quickly from the server. If you are unsure how your website is performing, consider running a test on your website using a service like GTMetrix to see what the page load speed looks like. If it is more than 3 seconds, your site is either very complicated or needs to be optimized so that users stay on the page and buy your product. The motto that visuals sell should not be taken lightly. We have found that the more attractive an product image or product video looks, the more likely a customer is to take action and purchase. Follow the tips below to optimize your images for the web and make your offering too attractive to pass up. 8. Take good quality photos! This may sound like a no-brainer, but make sure that your image are attractive. Hire someone to take professional photography and edit your images in a program like Photoshop to make your product look good. All of this being said, make sure that the images are optimized for the web. Any product featured image or other image in your WordPress gallery that is larger than 100KB is probably too big and will make your eCommerce SEO suffer. 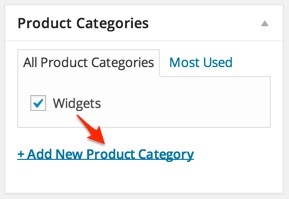 If you are using the free WooCommerce plugin to sell product on WordPress (recommended), you might notice that images appear blurry in product galleries. This is a feature of WooCommerce to save on page load speed, but it can also make your images look unappealing. To fix this, there is an image regeneration WordPress plugin that can be downloaded for free to alleviate the problem. Download “Regenerate Thumbnails” from the WordPress repository and install it on your site. 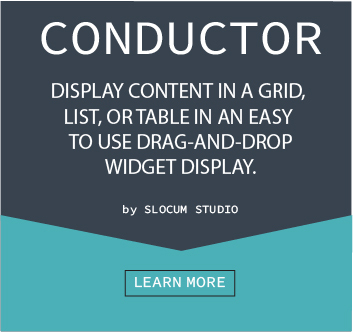 Run the program through your existing images under the Media sidebar section of WordPress. This will revert images to an acceptable thumbnail size. When you upload and attach images to your product, keywords are involved here too! With images and the web, the places to optimize the keywords are in the Title and Alt Text. Make sure that your originally uploaded file has a search engine optimized name and make sure that you create “Alt Text” that also taps into the long-tail keywords you want to rank for. Galleries are a great way to show more views of a product. Thankfully, WordPress has a built-in gallery feature to allow you to upload and display multiple photos at once. 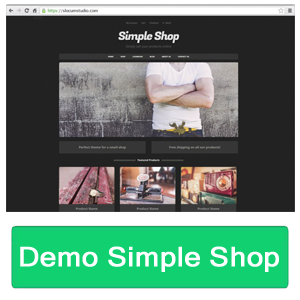 To access the gallery, go to Add Media > Insert Gallery while editing a Product in WooCommerce. WooCommerce also has a separate window (pictured above) to create a “Product Gallery” that will display on the front page of your site like you would see on a traditional eCommerce website. Make sure that your schema information matches the information in the product description with WooCommerce and WordPress and people will be able to see an accurate representation of the content before and after they click on the link in Google. Schema provides you with a look at the product from a Google search, enticing you to click and find out more information. Another awesome way to get attention to your site is to go social with all of your products. 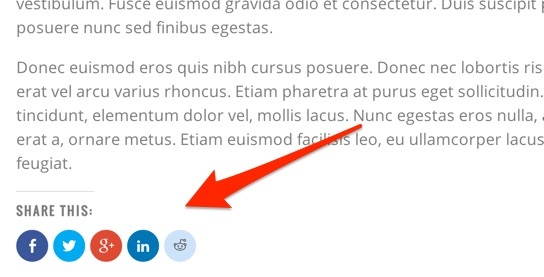 You can use the popular free Jetpack plugin and the “Sharing” add-on included with it to add social media share buttons to all of your product pages. Jetpack “Sharing” can automate the website so that you can instantly share content that you post on WordPress to your Facebook and Twitter accounts as well. Think of all the exposure even one share on Facebook or one pin on Pinterest can get! Make sure all of your product pages feature share buttons so that people can share their positive shopping experience with the world. This should have been number one on the list, but it can be among the more time consuming options on the list, so we saved it for the bottom. More and more people are buying products on mobile devices, with many industries approaching an almost 100% increase in mobile sales last year (2014). Making sure your site is mobile ready and designed to convert sales is critical to the shopping experience going into 2015 and beyond. Make sure that the WordPress theme is responsive or mobile ready. Did you know? Going into 2015, Google will be checking your website to make sure it is mobile friendly. Optimizing this will actually impact your search rankings as the search engine will rank mobile-ready websites more highly. It has been proven that people love putting product in a shopping cart just to have it in their “possession” momentarily. They will dream and then click off somewhere else. Can you blame them? Putting the product in your cart was an impulse from the start. And now you can go back to other products, compare, visit a blog, click an item in the sidebar, etc. Make sure that major sales landing pages are displaying on either a “Full-Width” or “Landing Page” template. Using these templates prevents users from finding easier ways to click off the checkout page and results in more sales. Want a quick case study? We simply changed to a full width page without a sidebar for one of our theme offerings and conversion increased by over 3%. The change was simple and increased sales! To create a splash page in full width or landing page templates with our themes, you can select the type of page you would like it to be from the sidebar as you edit content. There are plenty of businesses out there that cannot ship product for various reasons but would love to have a better eCommerce presence to allow clients to place online orders for pickup or delivery. Link your site with complementary or friendly businesses in the area. With all of these tools at your disposal, you should be confident in developing your site and increasing your conversions. Watch your sales numbers increase. Here is a video going over many of the elements discussed on the page from our SEO Lunch series. If you have any questions or tips, please get active below in the comments! We just finished article writing on google’s latest algorithm change regarding using mobile friendly as a signal for search engine ranking and how it is becoming more important to follow google’s basic site design guidelines. Your post was a great in terms of averall serch engine improvement and will be very useful to small store owners to understand what exactly SEO is? Good stuff, Dan. I really like the tips regarding review/schema. Its amazing how so many WP ecommerce sites are not doing it. Thanks a lot for such a nice article. I have just started my website and it will help me gain my SEO. Great tips here, we used some of them on our latest site. Thanks for sharing! good stuff and complete guide. Boookmarked, so I can back here later if I fell like I miss something out. You did great job, Dan.